Click here to return to the main 2014 General Piccies Page. 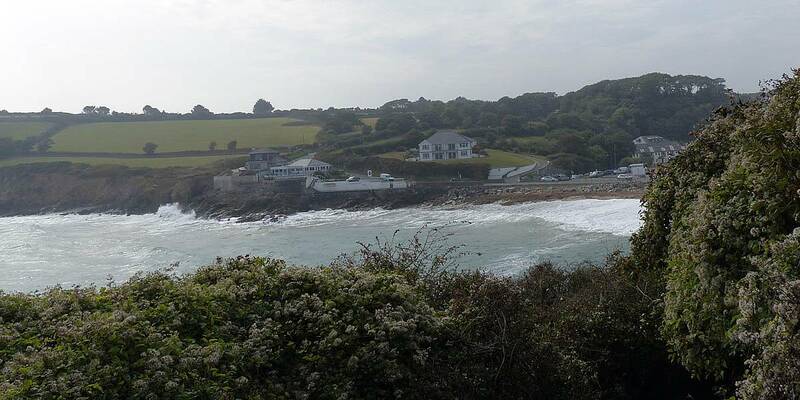 Click here to go forward to Cornwall 2014 Day 2. 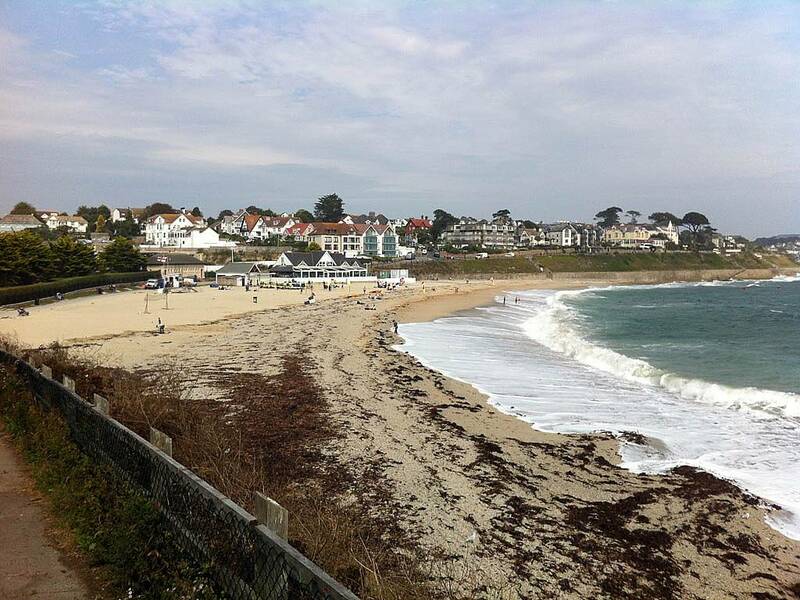 Renée Murad and I went to Cornwall for a long weekend. I had booked 4 days off work. Despite concerns about recent good weather showing signs of breaking down, we did well for weather with it being warm and a mixture of fog, cloud and sunshine, albeit rather humid. 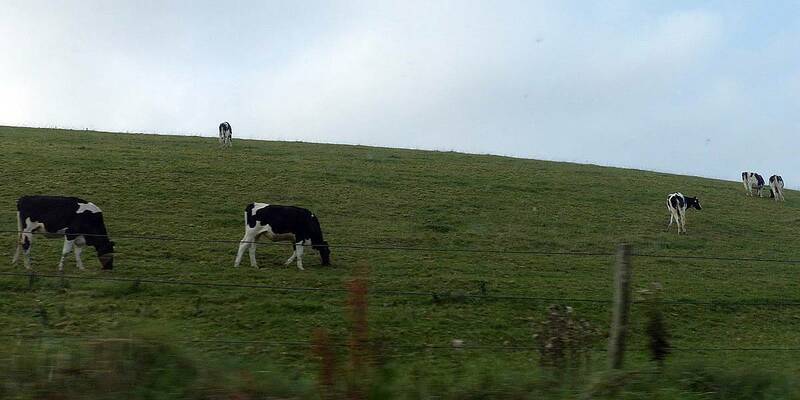 The lack of rain in such a wet part of the country was most welcome. 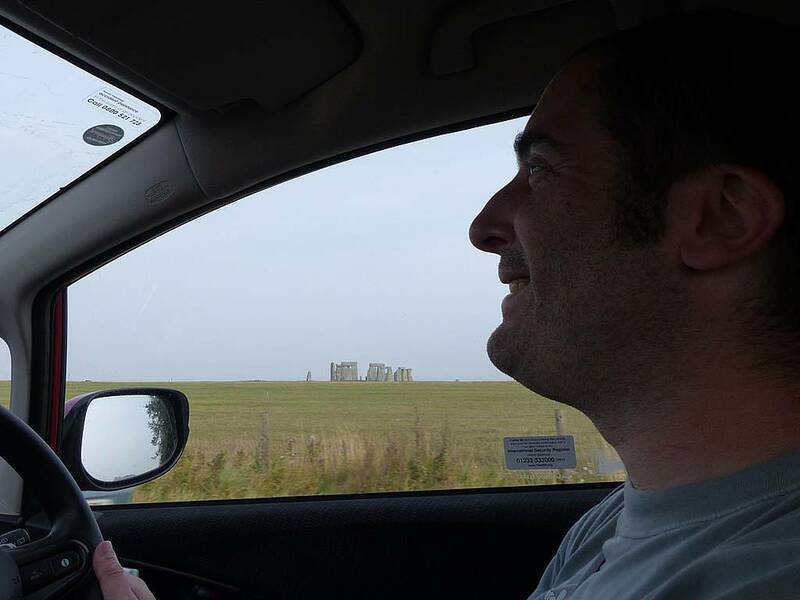 On day 1 we left London early to have breakfast at Lasham Gliding Society before having a pleasant drive out past Stonehenge to Cheddar Gorge. 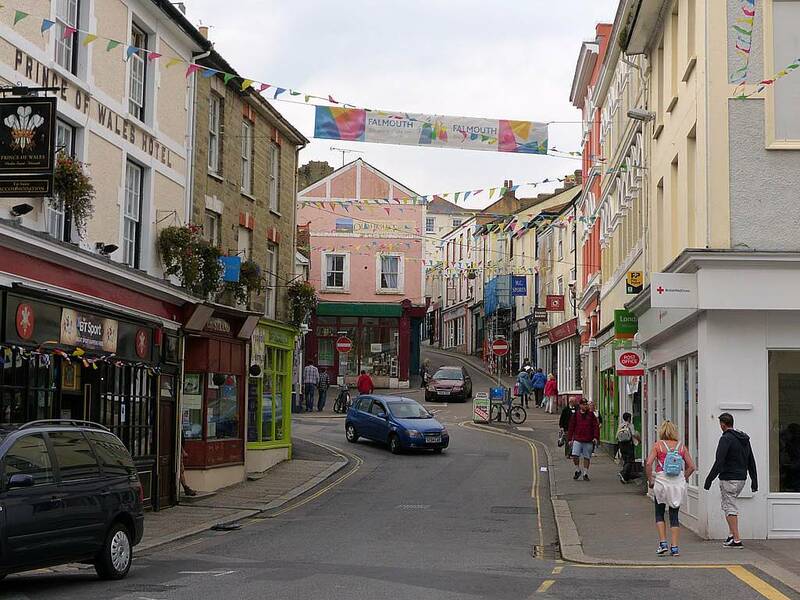 Then after escaping the Cheddar tourist trap we made a beeline for Falmouth. After a nice beach picnic we explored the local beaches before checking into the BnB. 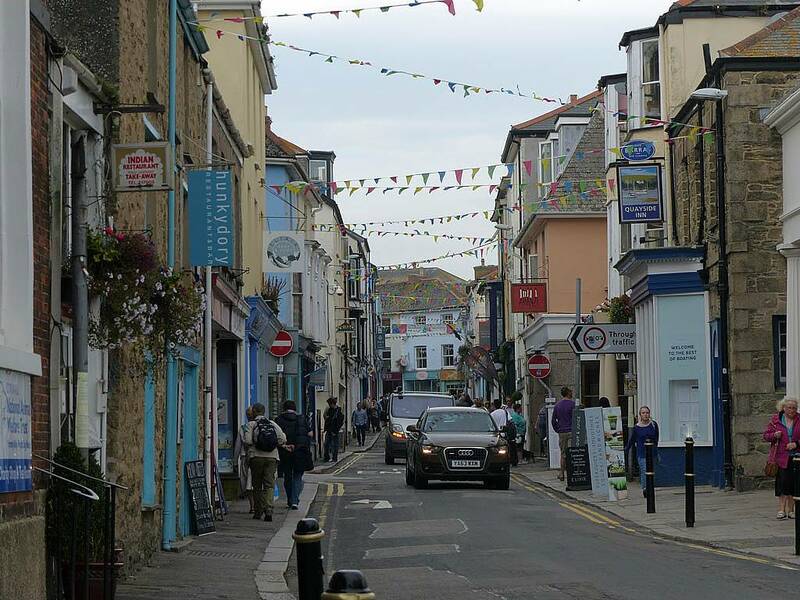 Then we went for a wander around the centre of town before a delicious meal at Rick Stein's Fish restaurant. On day 2 we went to the Eden Project. After sweating it out in the Biomes in full sunshine and a wander outside we headed out after 2 hours to Truro where we had Cornish Pasties for lunch. 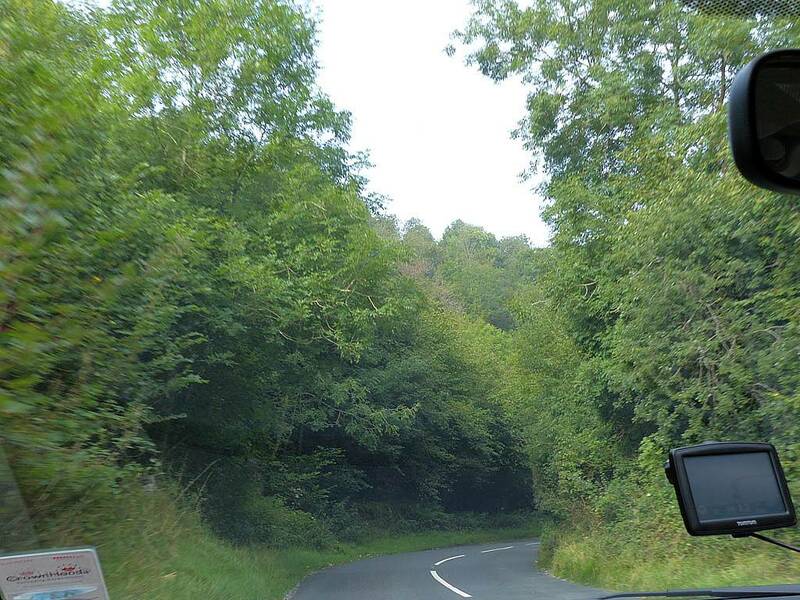 After a rest back at the BnB we explored local roads down to Maenporth and Mawnan on narrow twisty roads. Then after a circuit of Pendennis Point we had a nice dinner at Balti Curry house. 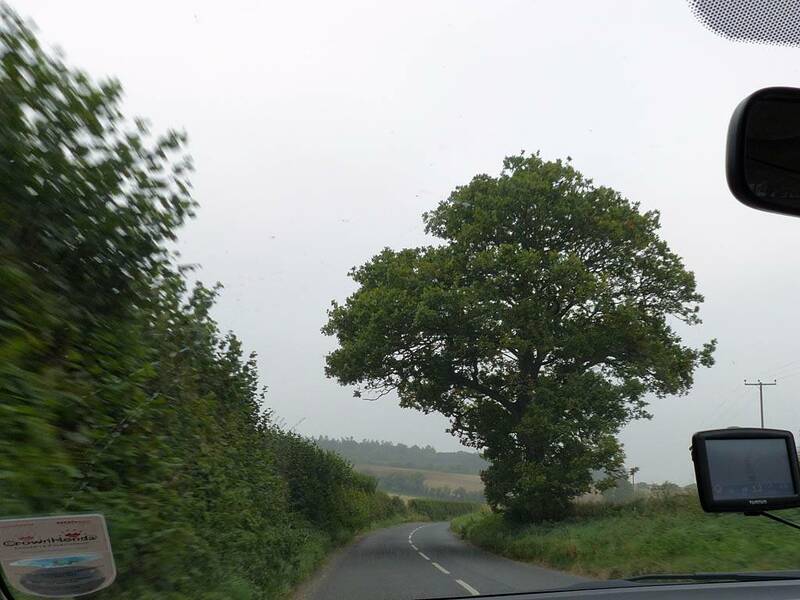 Day 3 was foggy all day in Southern Cornwall. We visited the Lost Gardens of Heligan which was better than the Eden Project. The jungle section in particular was awesome, complete with a rope bridge. After exploring the gardens and a late lunch in the tea room, we made a beeline for Padstow where it was warm and sunny, perfect for some Cornish ice cream. Then after a delightful drive along the coast to Newquay we headed back under the fog to Falmouth in time for a pizza for dinner. Day 4 started off foggy as we checked out from Falmouth. 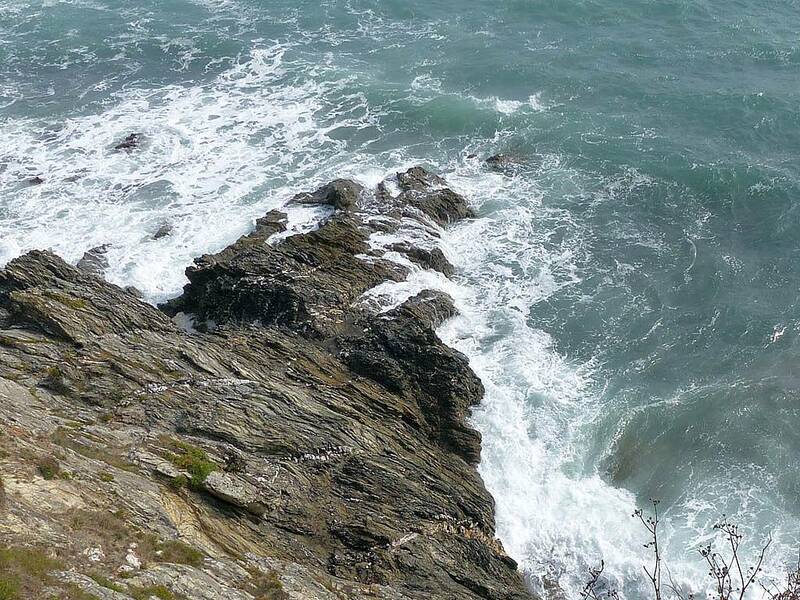 However Lizard Point was in warm sunshine and was well worth driving to. Even better was Kynance Cove which was stunningly beautiful. The main disappointment of the day was Lands End. It was a blatant tourist trap and the views were spoilt. But atleast I can say I've been there but won't want to ever return. 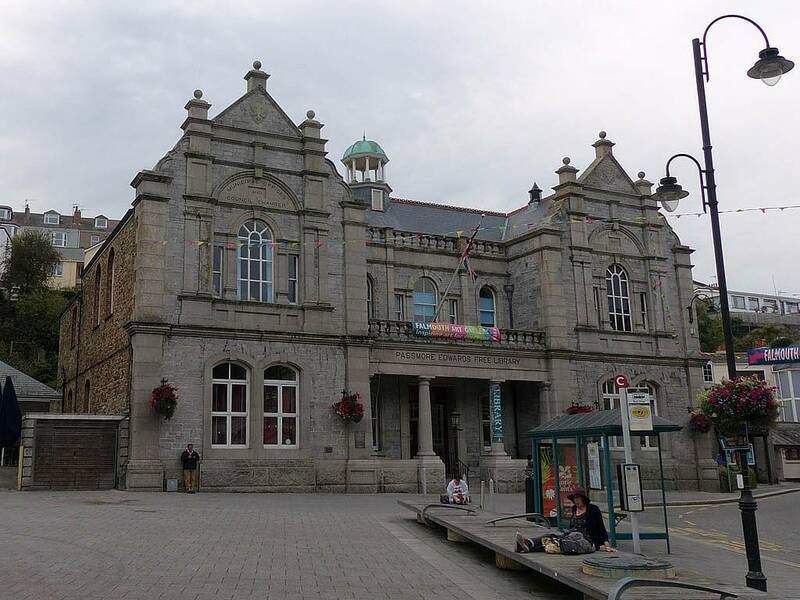 Back in Penzance we had a little look around before checking into the BnB. 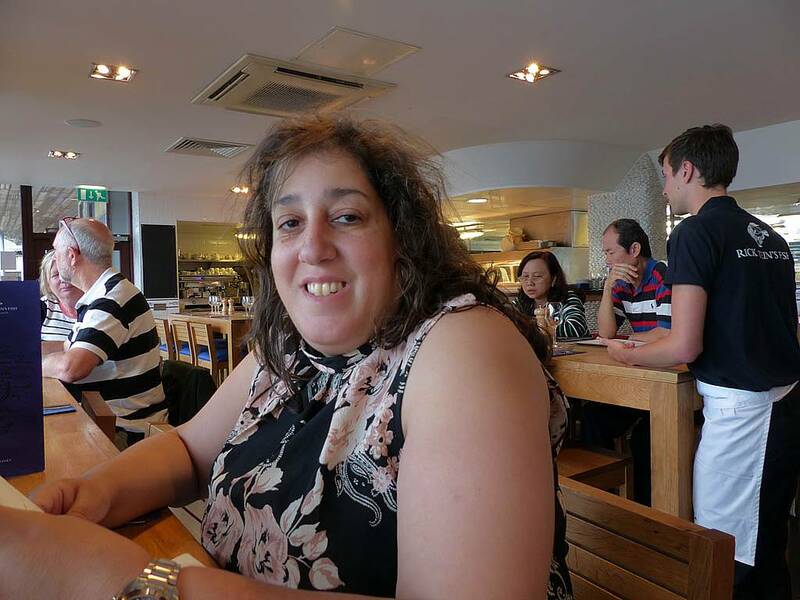 The evening meal was in Thai Moon restaurant, followed by a short evening walk along the promenade. Day 5 was spent mostly in St. Ives. 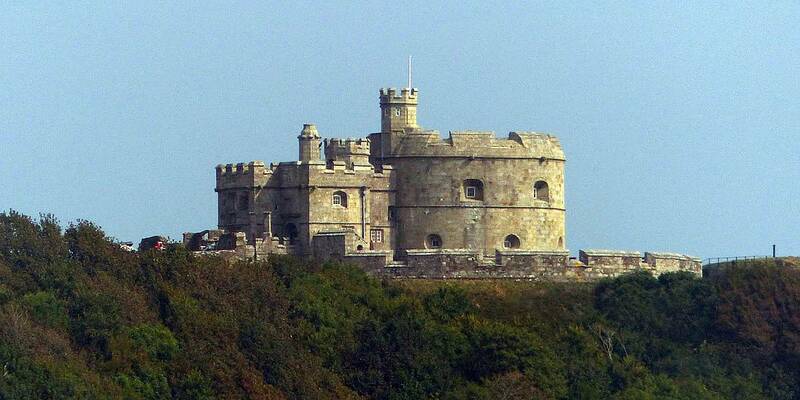 After a closer look at St. Michael's Mount we headed straight to St. Ives. We parked a little out of town and used the park and ride buses to get easily into the town centre. 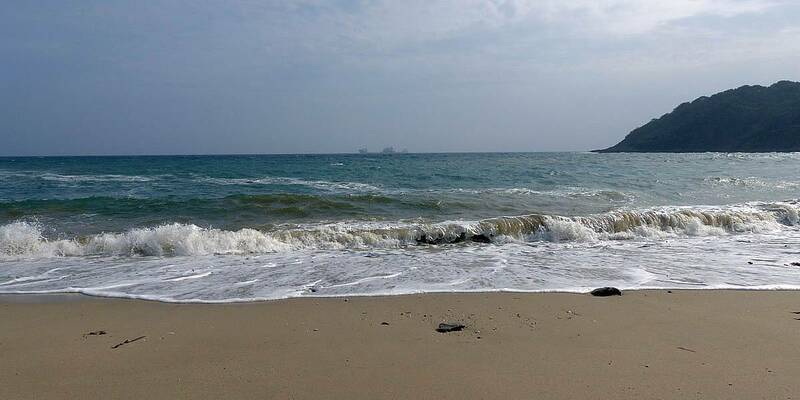 After a walkabout exploring the shops and St. Ives Head we ended up at Porthmeor beach where at low tide there was plenty of sand and paddling. 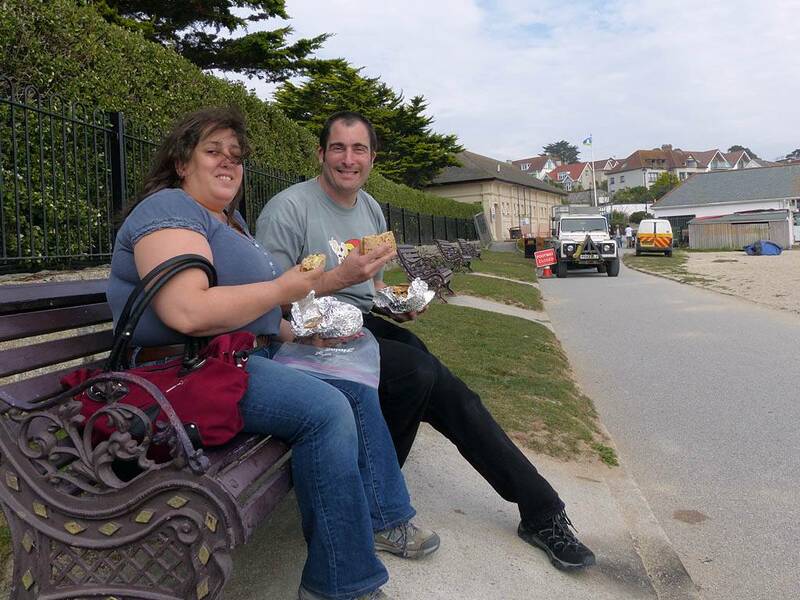 Then back to the shops to get some lunch (more pasties!). 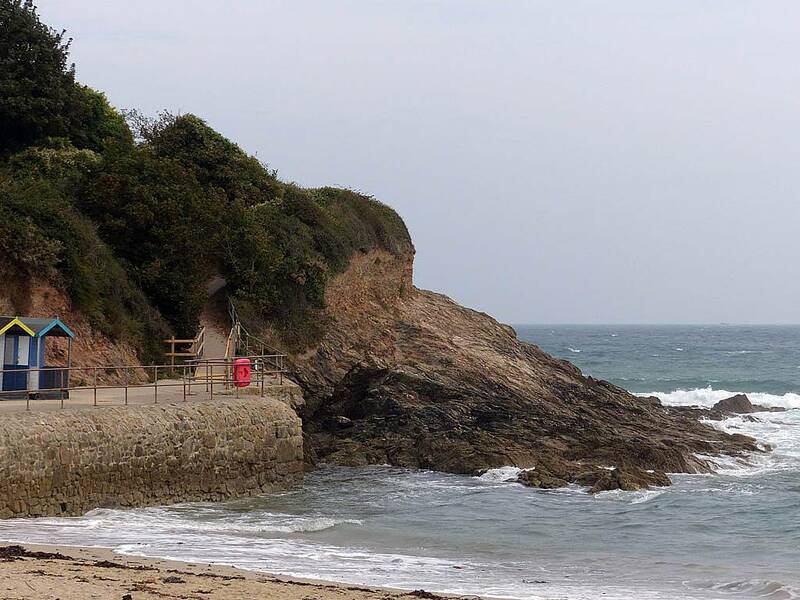 We went the other way to Porthminster beach and ate lunch on the rocks. However this beach was more sheltered and not as fun. 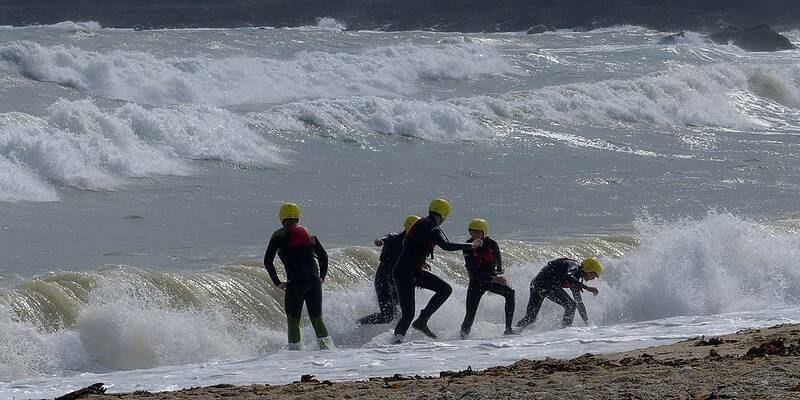 So we returned to Porthmeor Beach where we paddled some more as the tide came in and the surfers had fun in the big surf. We had a break in a nearby tea room in the middle. Late afternoon wedried off and had a nice drive back to Penzance via St. Just on pleasant sunny country roads. We finished the trip with a meal at Gino's, a nice local Italian restaurant. 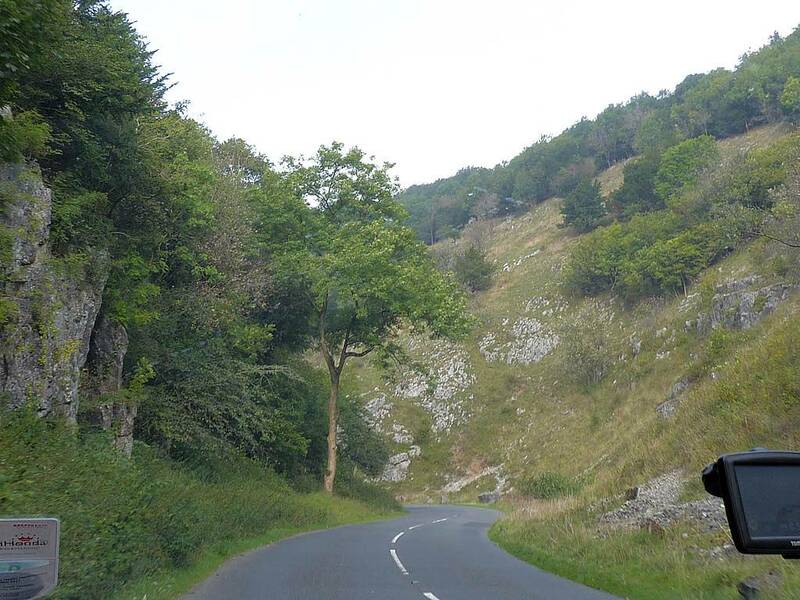 On day 6 we checked out early and after a drive by of Tintagel we pushed over the border into Devon, through Tavistock and up onto Dartmoor. Up there the scenery was breathtaking, and lovely cool crisp fresh air. Sheep, cows and ponies roamed free too. 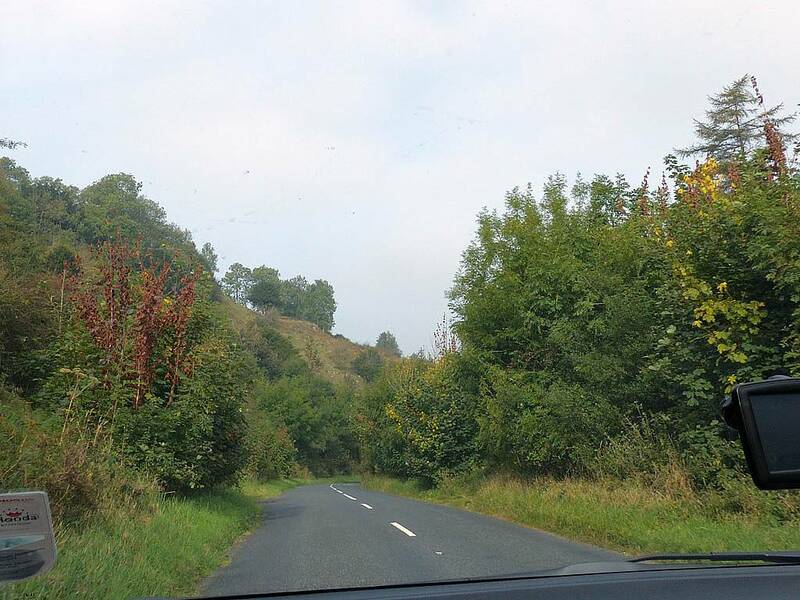 After a few stops for photos we carried on enjoying the amazing roads until we dropped down over the River Dart and were soon on the M5. From that point it was a straight forward trouble free drive home. Many thanks again to Renée for taking lots of pictures while I was driving. This made it possible to document parts of the trip that would otherwise have been impossible to do so safely. We woke up at 6AM just before the alarm was due to go off and were raring and eager to go. We had finished packing the night before and we and our luggage were in the car by 6:30AM. I'm glad we were slightly early as the North Circular was very congested. 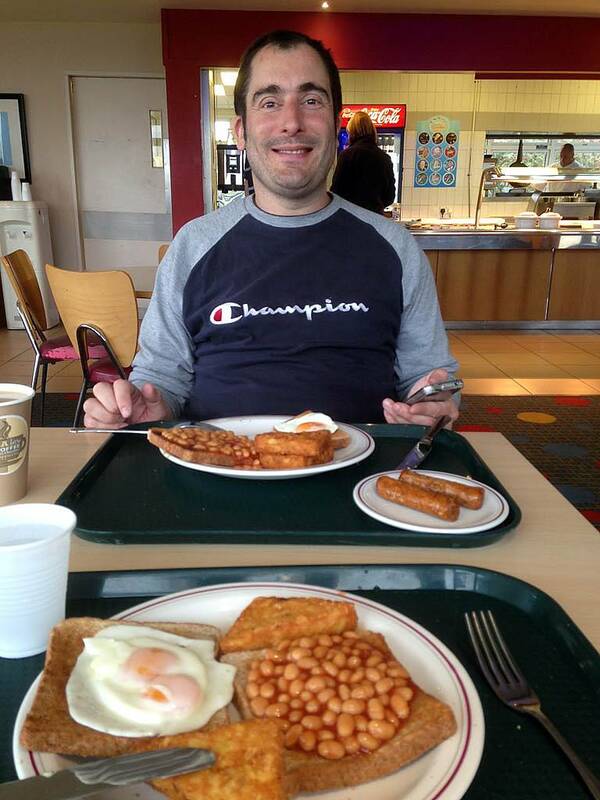 Atleast the M25 was ok. We got to Lasham Airfield at 7:55AM and had a lovely cooked breakfast. 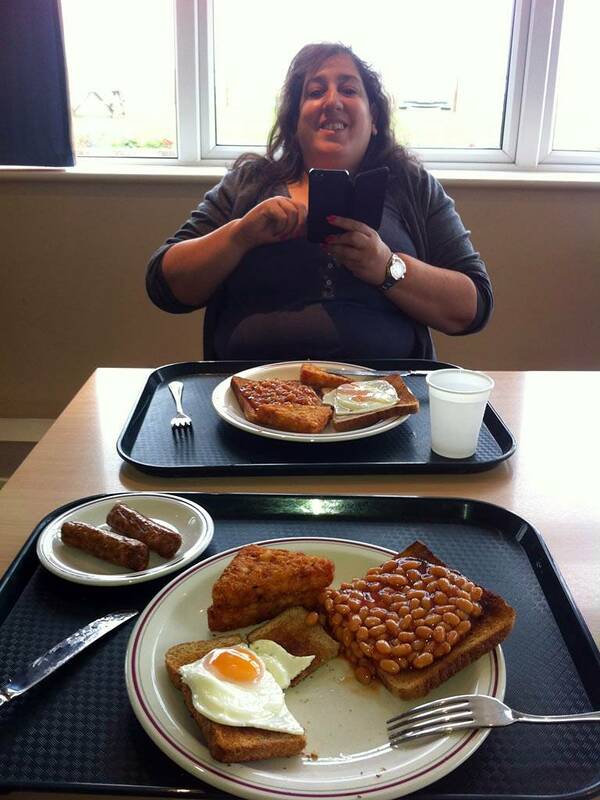 Renée and Mike enjoying breakfast at Lasham. 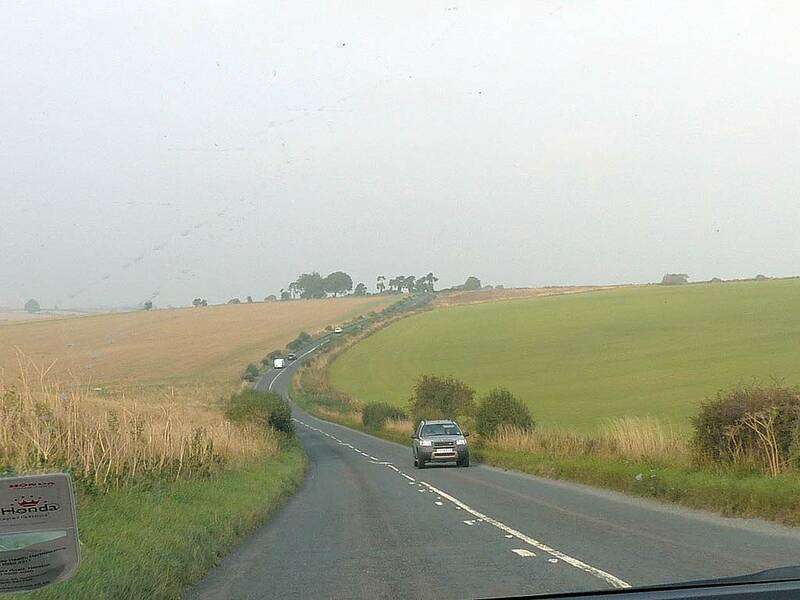 Soon after 8:30AM, with the rush hour traffic now a distant memory, we set off Westwards down the A303. 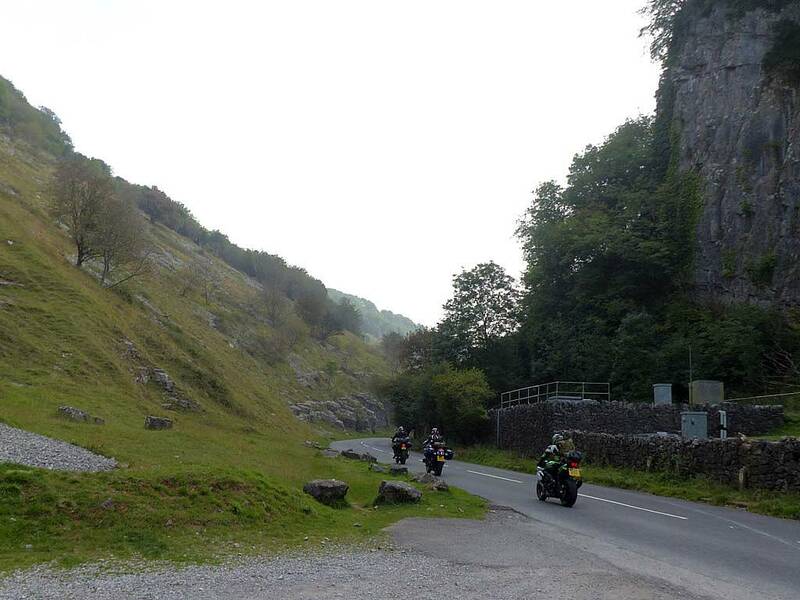 We soon passed Stonehenge and switched to some lovely minor roads which took us to Cheddar gorge for 10:30AM. 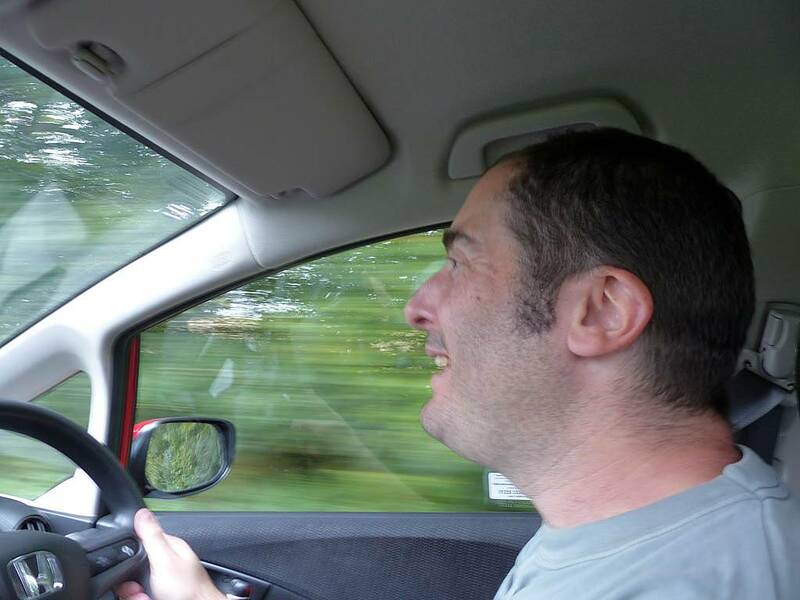 Mike enjoying the drive out from Lasham. 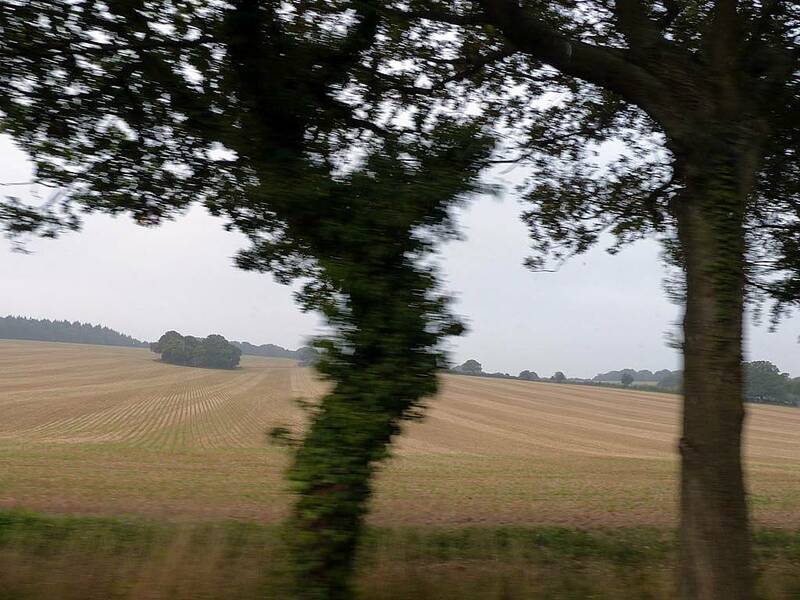 Enjoying the North Hampshire countryside whizzing past. 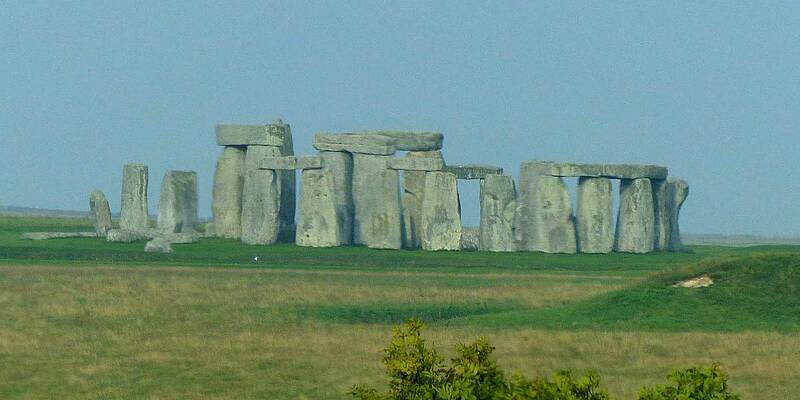 Driving past Stonehenge. 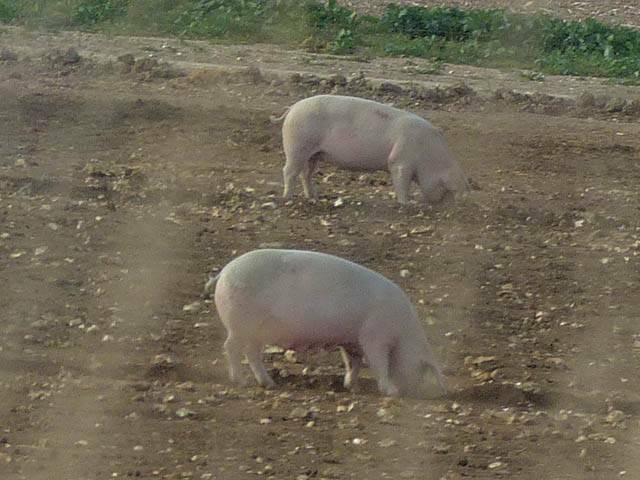 A pig sty near Stonehenge. Having fun on the B390. 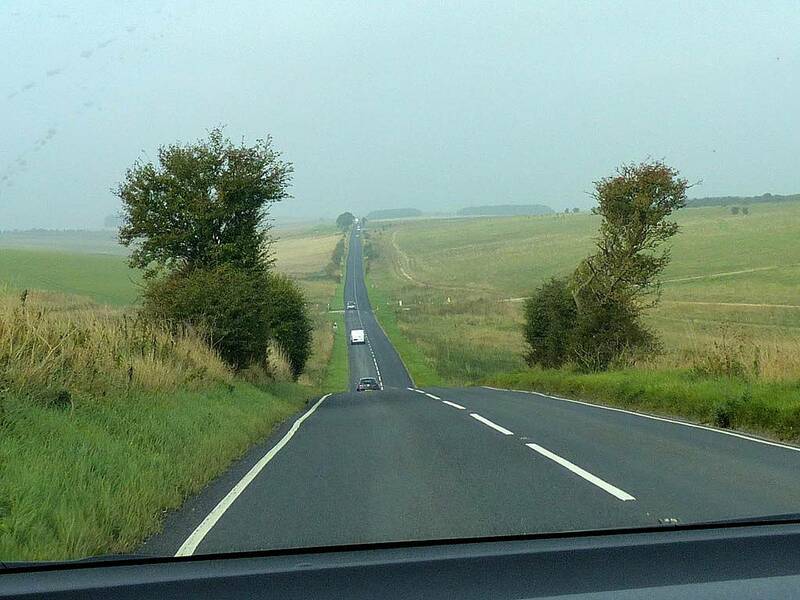 Prettier than the dual carriageway A303. Cows by the road. 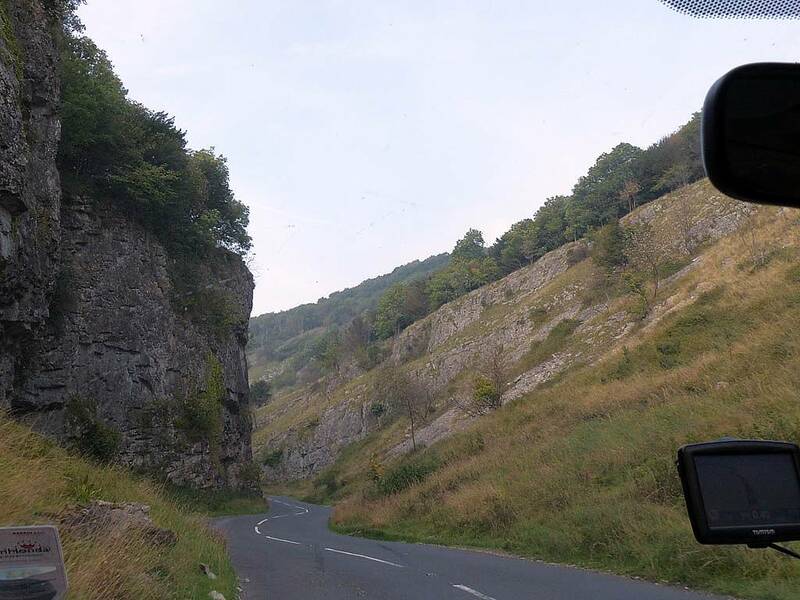 Approaching Cheddar Gorge from the Eastern side on the B3135. What a pretty place it was. We briefly stopped for pictures where a man was rock climbing. 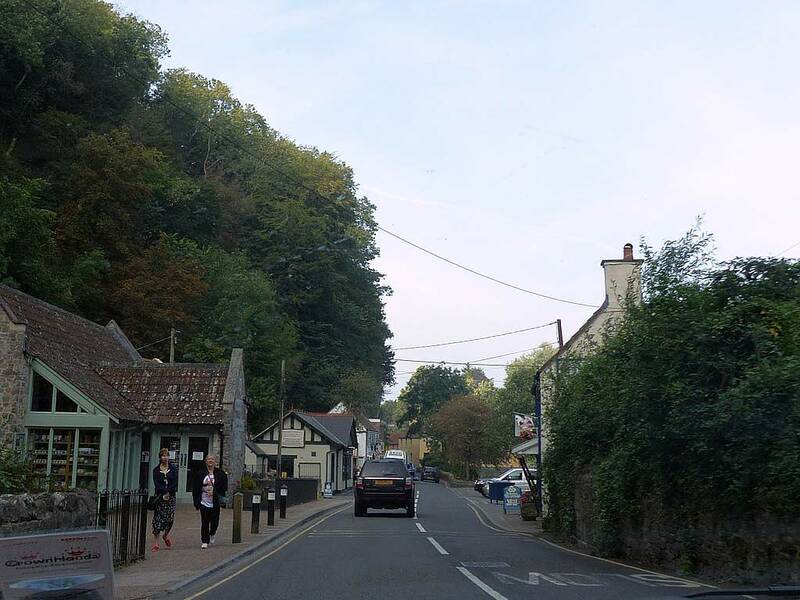 But Cheddar itself was a horrible tourist trap so we didn't stop there and made a hasty exit. 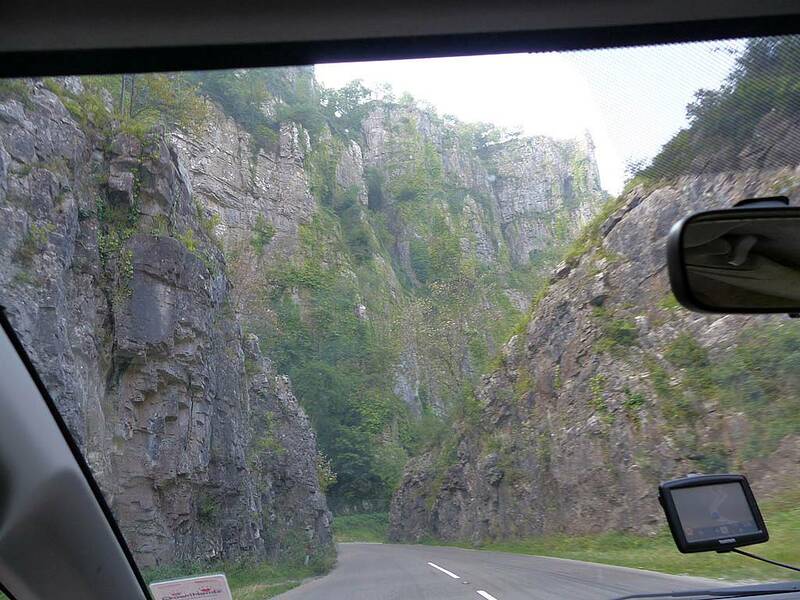 Driving into the gorge. 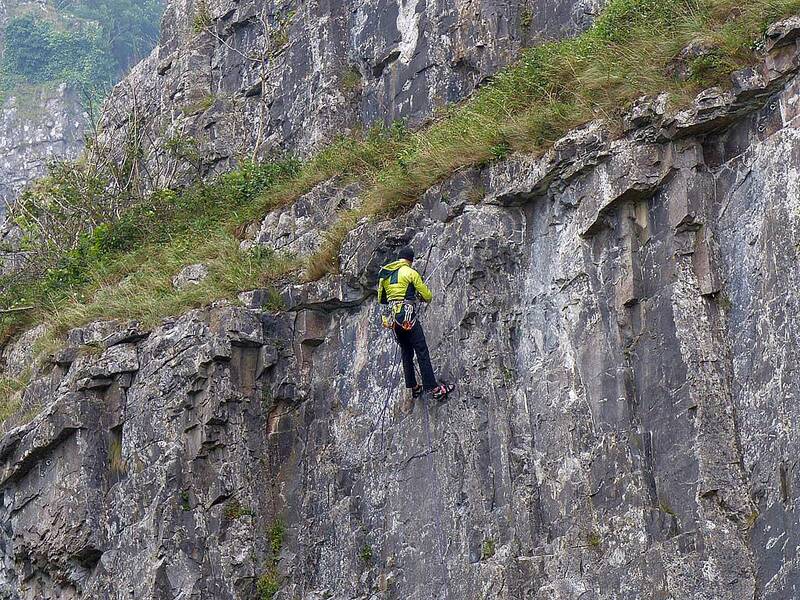 Rock walls rise as we get deeper into the gorge. 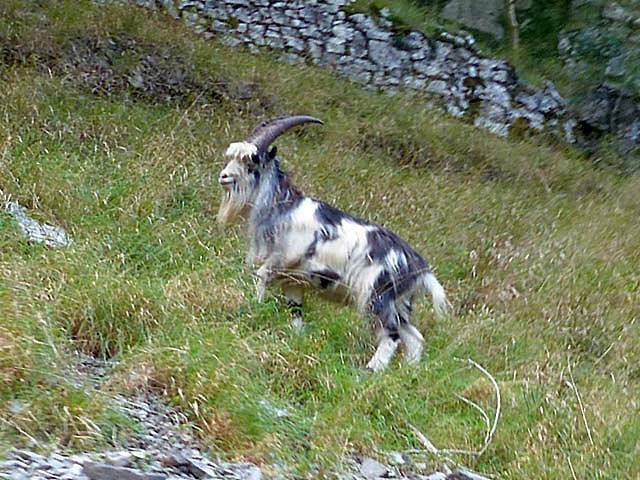 A local resident. 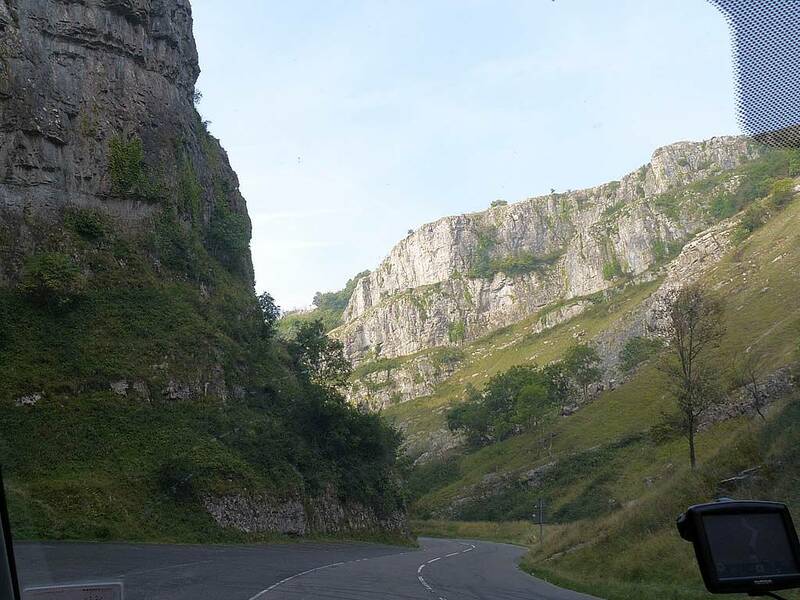 Cheddar Gorge is an awesome place to ride! 360 degree panorama deep in the gorge near where a rock climber was having fun. Close up of the rock climber. Renée posing in front of the rock climber. 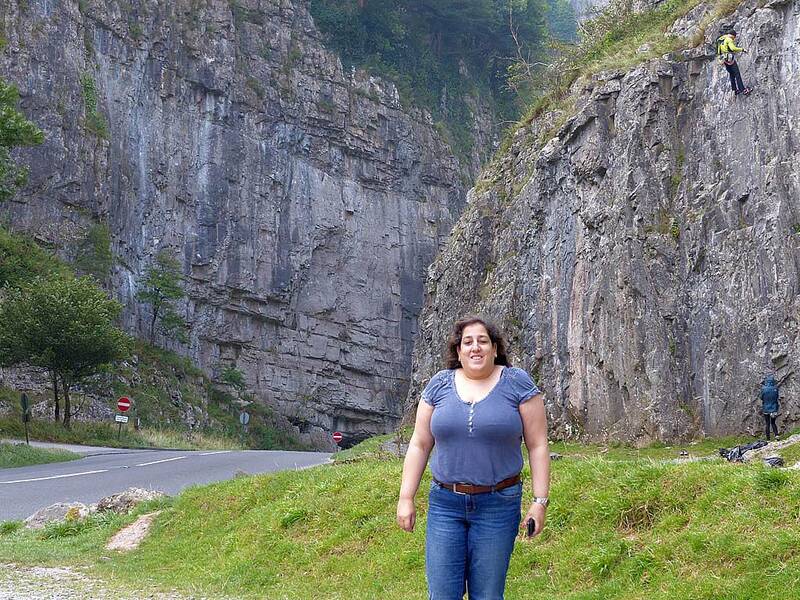 Enjoying the twists and turns through the narrowest deepest part of the gorge. 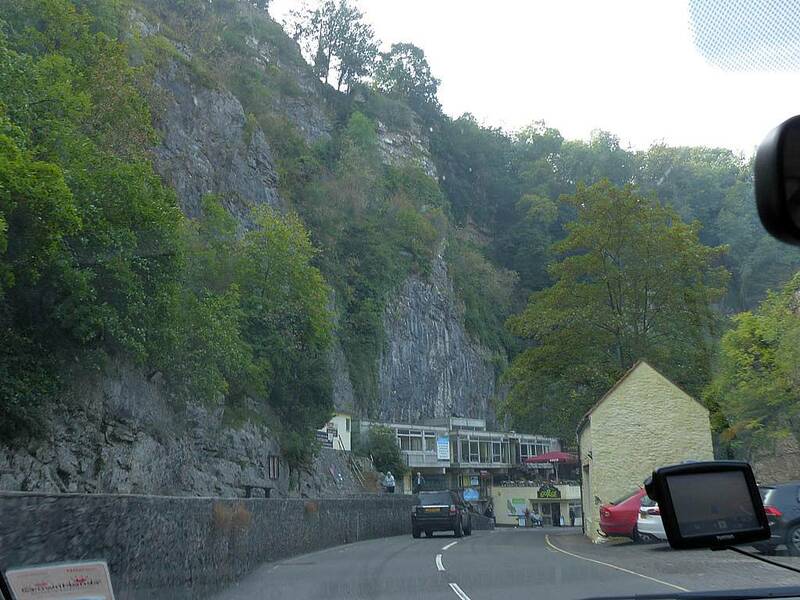 Driving into and through the tourist trap of Cheddar. Before long we were whizzing down the M5 into Devon and Renée snoozed for a while. She woke up again though by the time we crossed the border into Cornwall at 12:05PM on the A30. 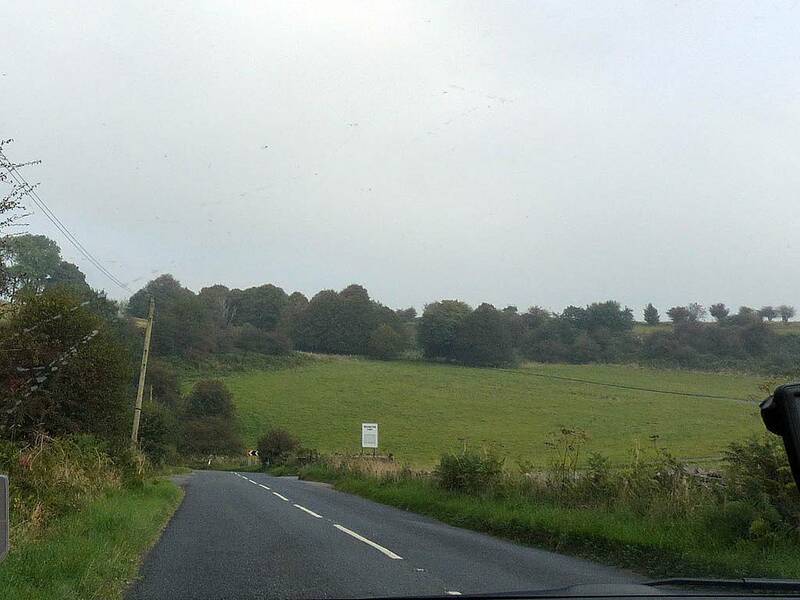 (This end of the road is orders of magnitude prettier than the other end at Heathrow!) 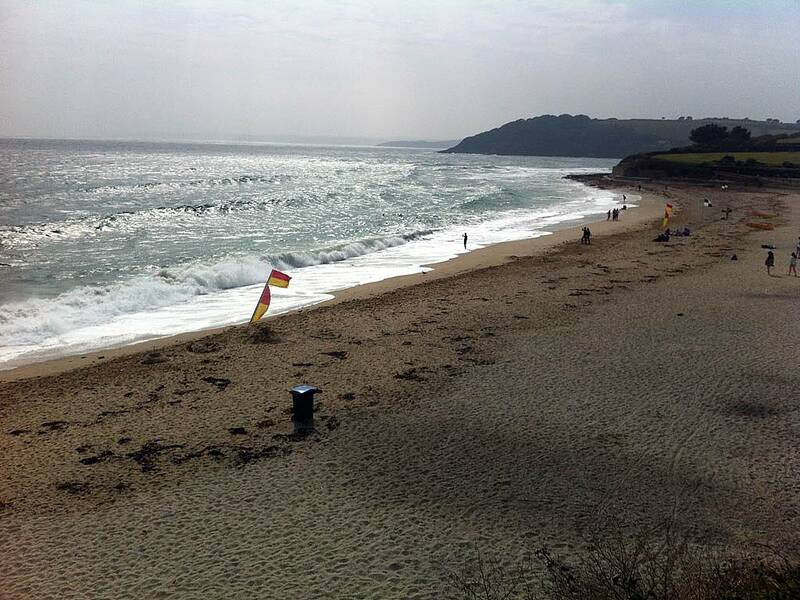 Near Truro I took a petrol stop then blasted down the A39 to arrive in Falmouth at 1:20PM. This was much earlier than expected and gave us bonus time to have a good look around in the nice weather. 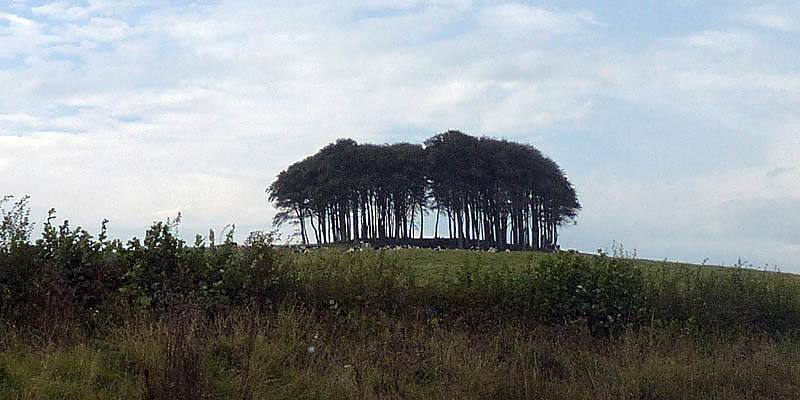 A tree topped hill. 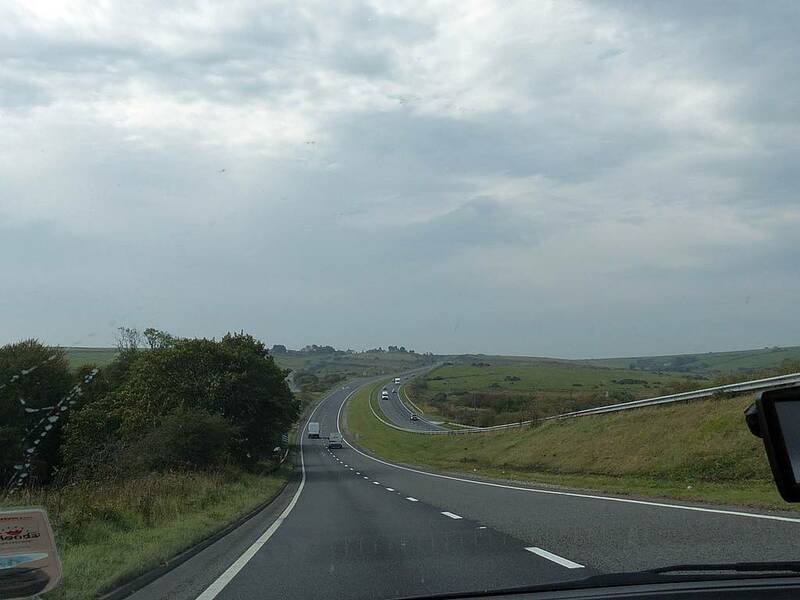 Driving along the A30 as we enter Cornwall. 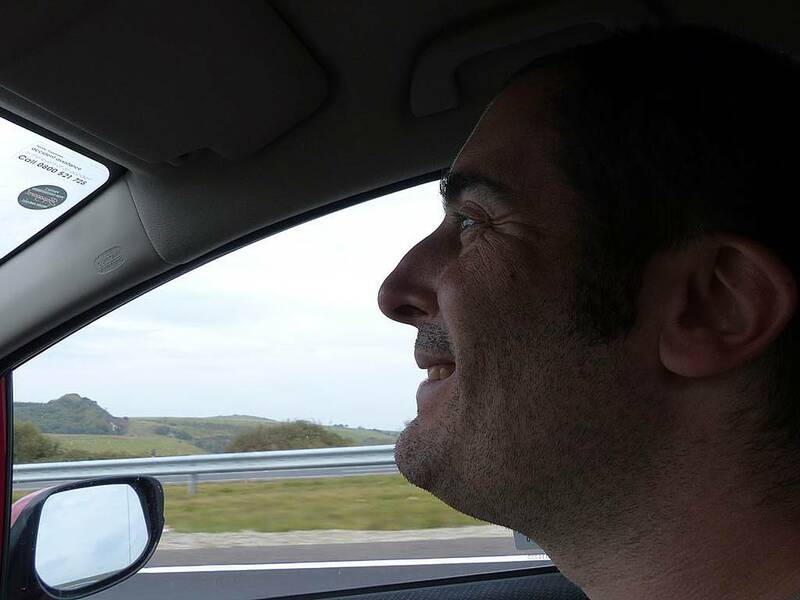 Mike having fun into Cornwall. After parking up by Camelot BnB we walked down the hill to Gyllyngvase beach. The view as we approached was outstanding. 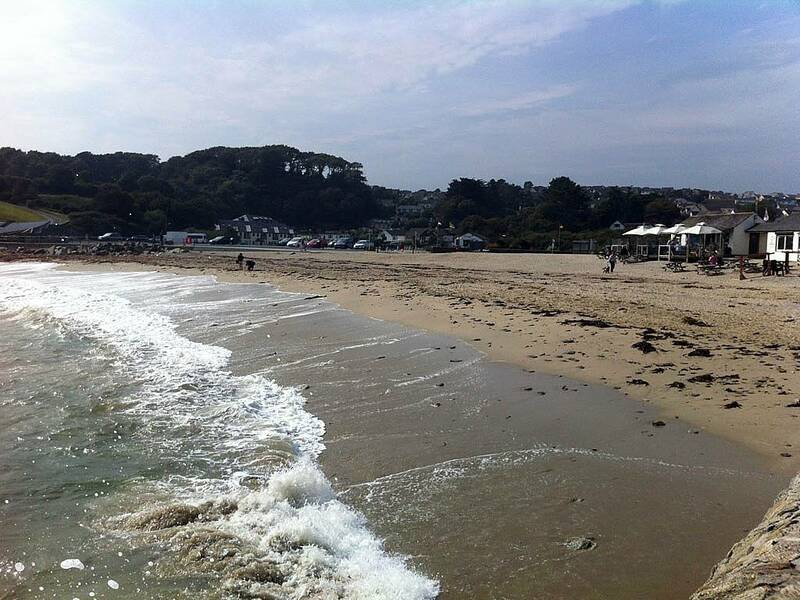 Here we ate our sarnies on a bench while the waves broke and people played beach volleyball. 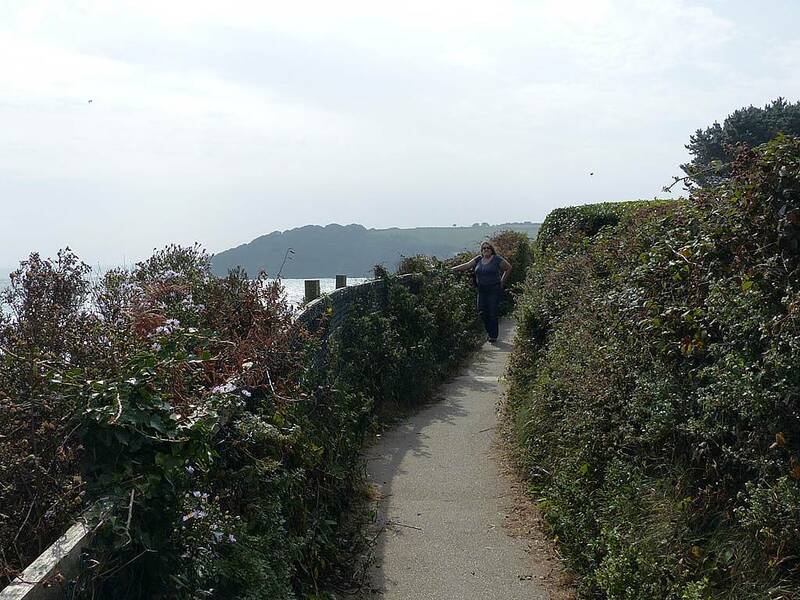 Then we walked along the coast path over some cliffs to Swanpool Beach and Lake. Surfers there were playing in the big surf. We ate the rest of our lunch there before we backtracked via Queen Mary Garden by Gyllyngvase beach. 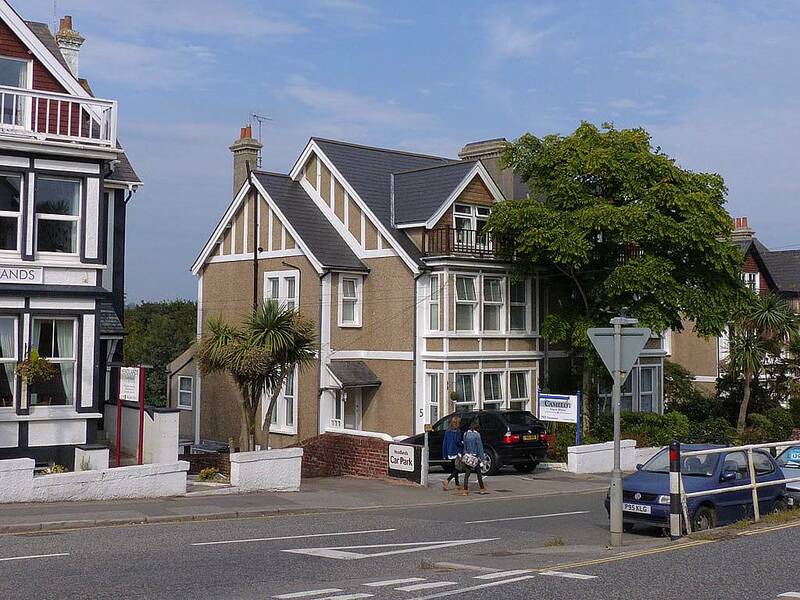 Walking down Gyllyngvase Road from the BnB to the beach. Views of Gyllyngvase Beach from the bottom of the road. Eating our sarnies by the beach. 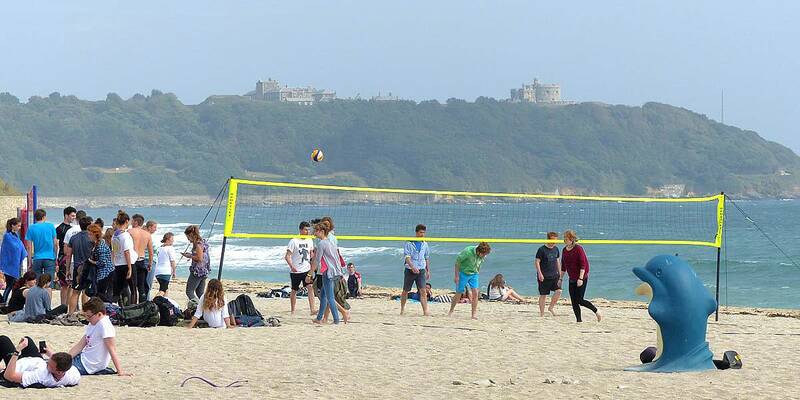 Pendennis Castle from Gyllyngvase Beach. Beach life. A quick look at Queen Mary gardens as we pass. More views of Gyllyngvase Beach from the coast path as it climbs up over cliffs to the Southwest. The coast path between Gyllyngvase and Swanpool beaches. 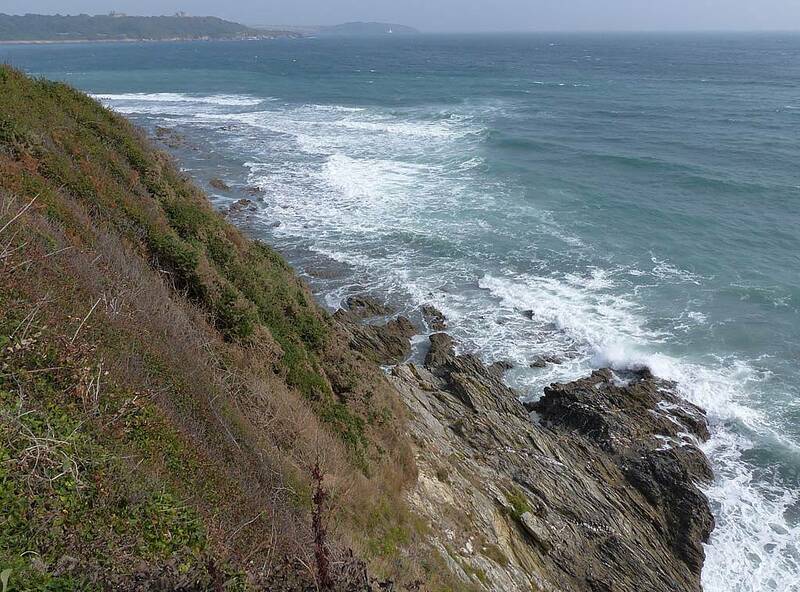 Cliffs below the coast path. Swanpool Bay from the Northeast. 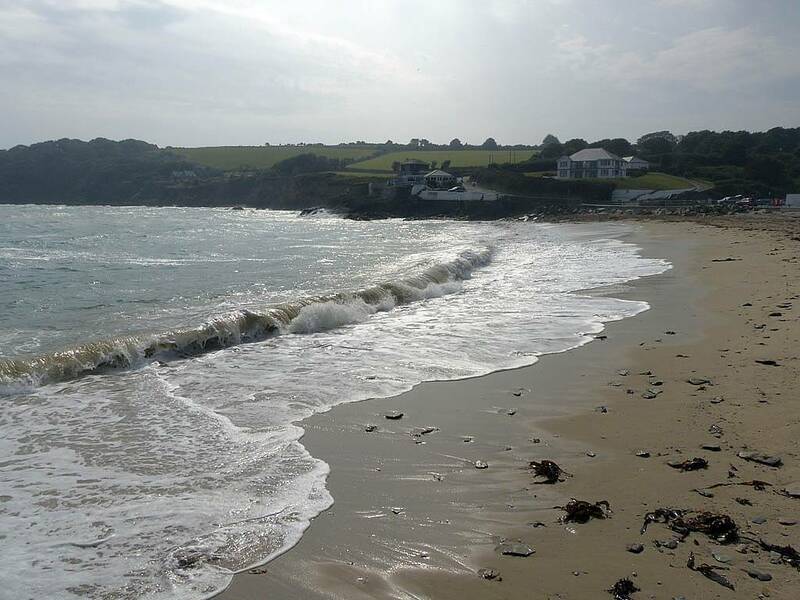 Swanpool Beach. 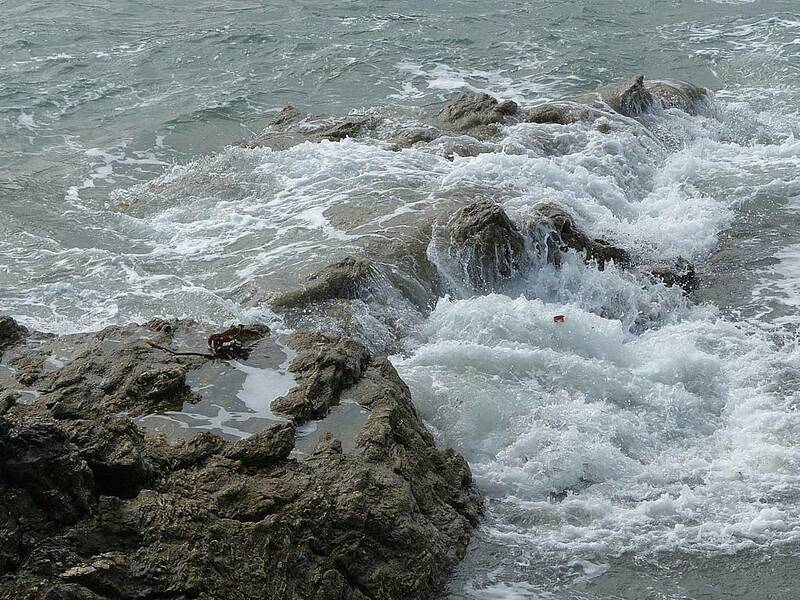 Waves washing over rocks where the coast path meets the beach. 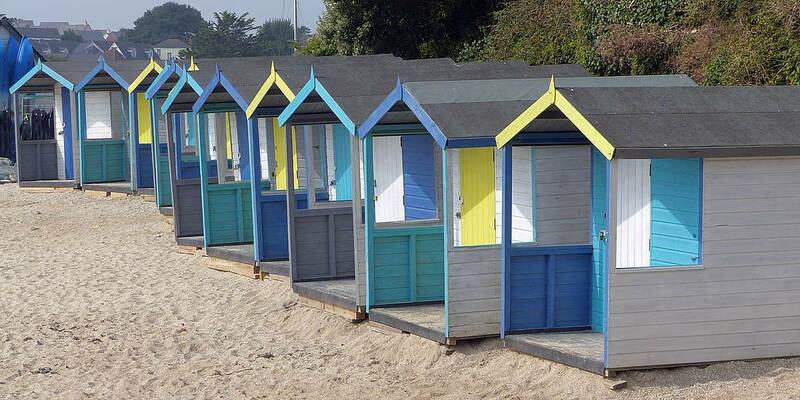 Classic beach huts. 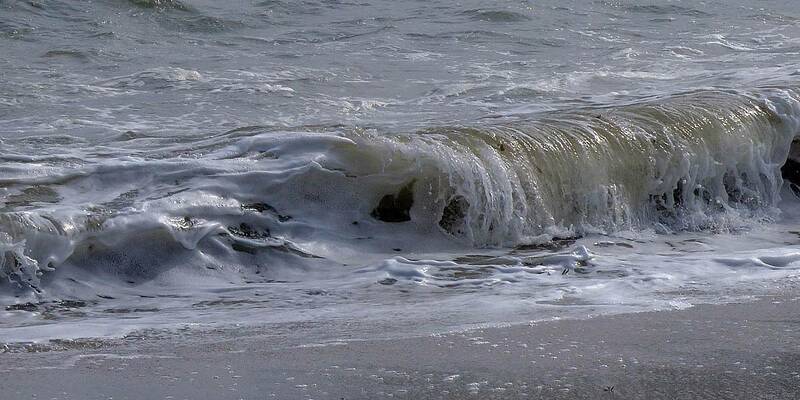 More views of Swanpool Beach and the waves as they break. Surfers enjoying the surf. 360 degree panorama by the Crazy Golf course by Swanpool Lake. 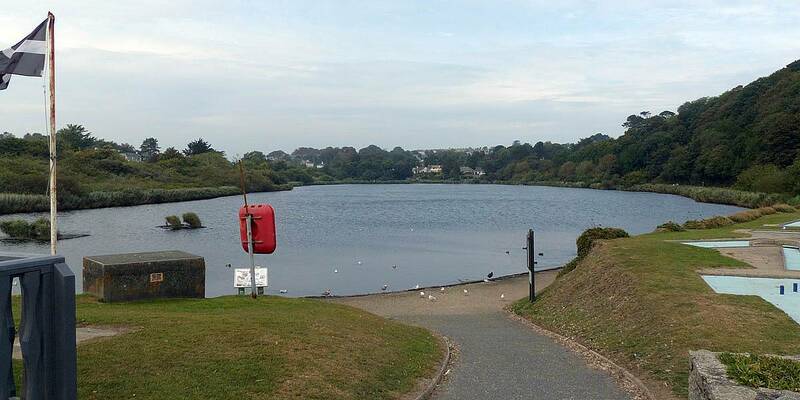 Swanpool Lake. 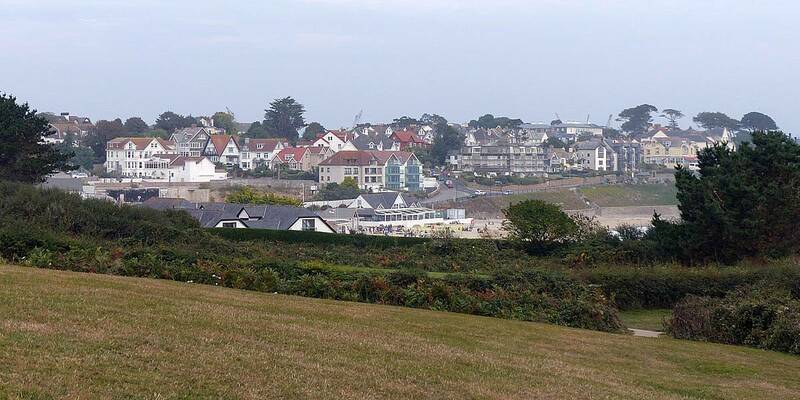 Looking back at the coast path as we prepare to backtrack to the BnB. 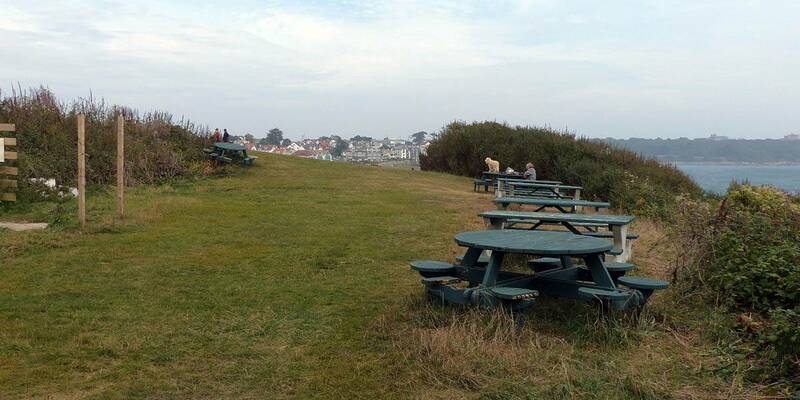 Just above the coast path is a rather nice picnic spot. Looking back to Gyllyngvase Beach from the picnic spot. 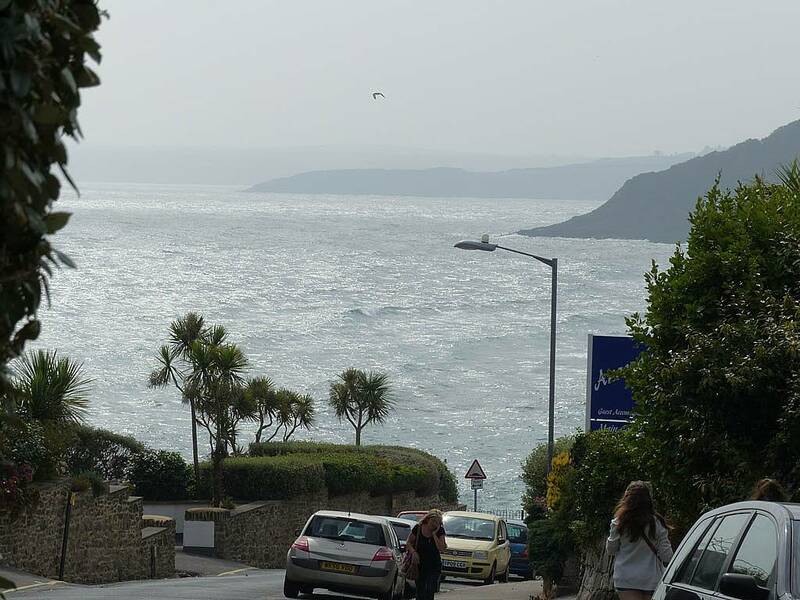 Looking out to see the Lizard Peninsula can just be seen through the haze. 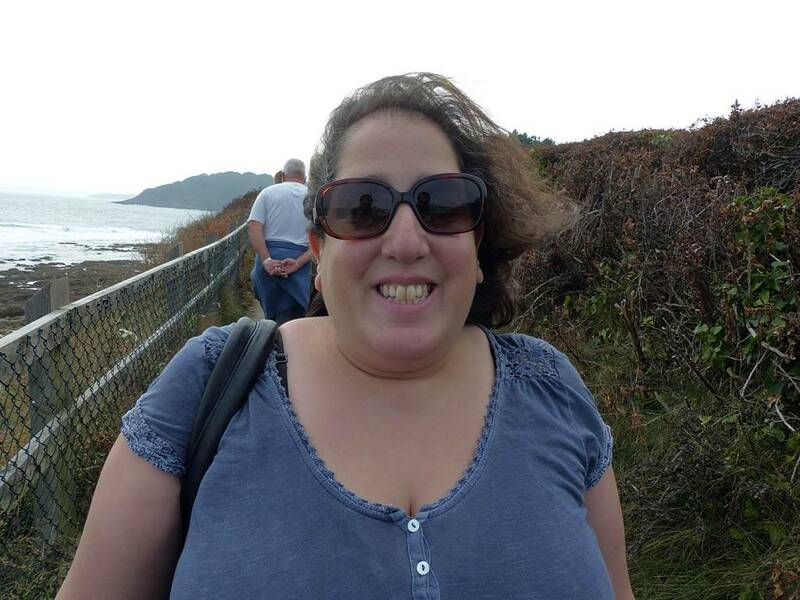 Renée enjoying being in Cornwall. 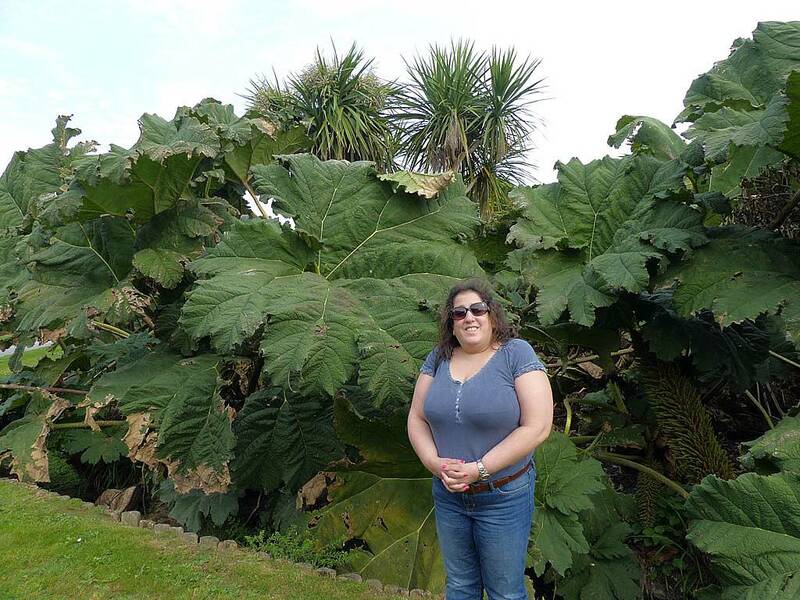 Renée showing how huge those Giant Rhubarb leaves are in Queen Mary Gardens. 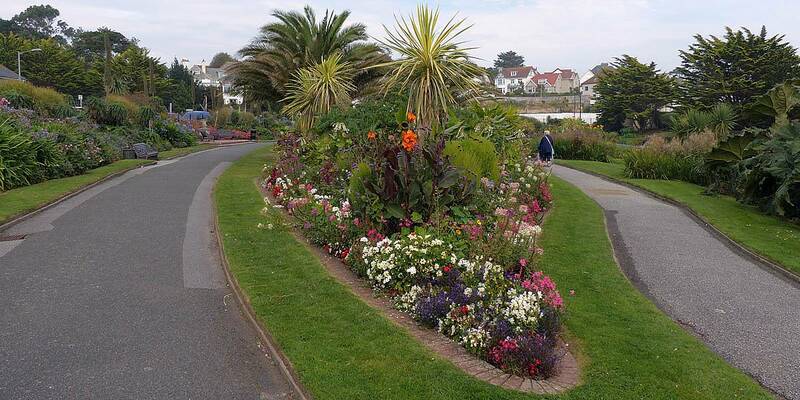 Queen Mary Gardens. We decided to check into the BnB at 3PM. We were an hour early but that was no problem. The owner served me a nice cup of tea and gave us a map tour of the area before showing us to our room. After getting the luggage in from the car we rested at 3:30PM for half an hour as we were exhausted after such an early start and long drive, not to mention that lovely fresh sea air! Camelot BnB. 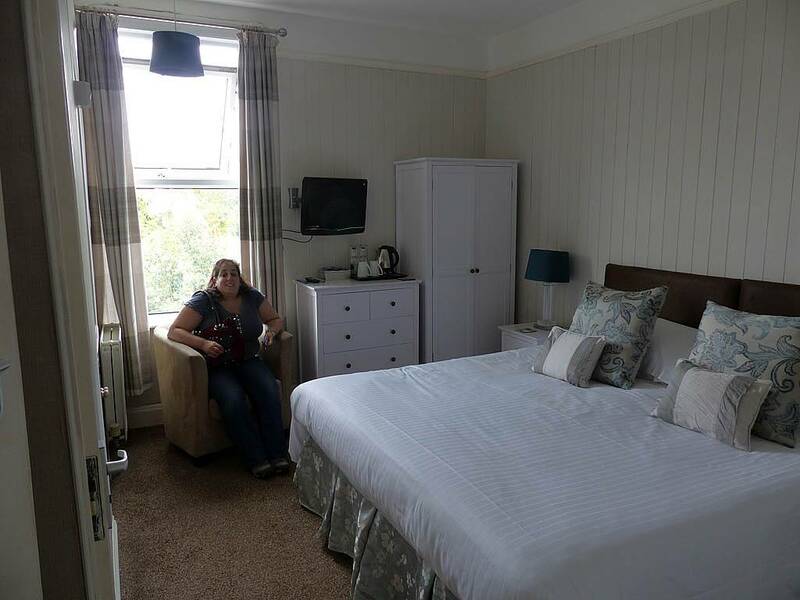 The bedroom is nice and cosy. Camelot breakfast room. At 4:10pm we walked down the hill to the Main Street. (On the way down a drunk man spotted my danger mouse t-shirt and starting singing the theme tune lol!) We looked at all the shops and restaurants. There were so many pasty shops! The gift shops though were just a load of junk and tourist trap tat though. At the other end were more regular shopping chains. 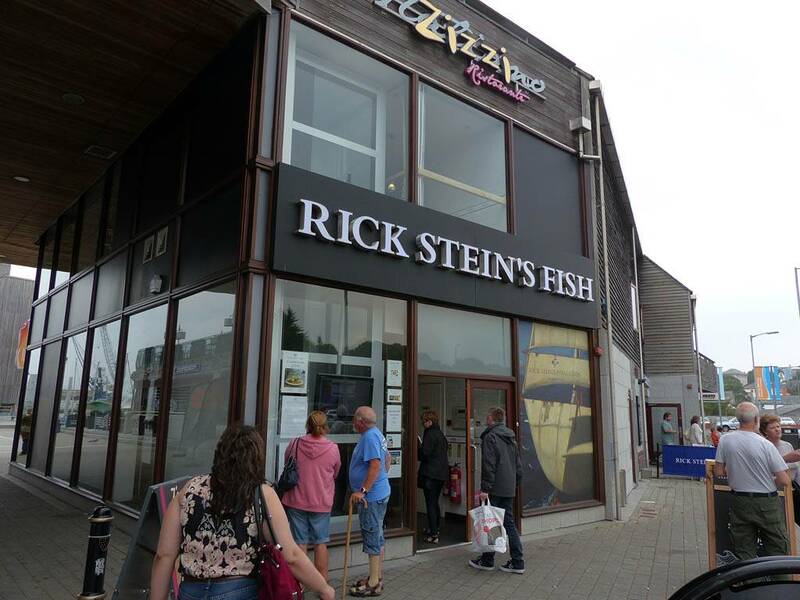 We about turned at the end and returned back to where Rick Stein's is. We had a quick look at the harbour before going in to eat. 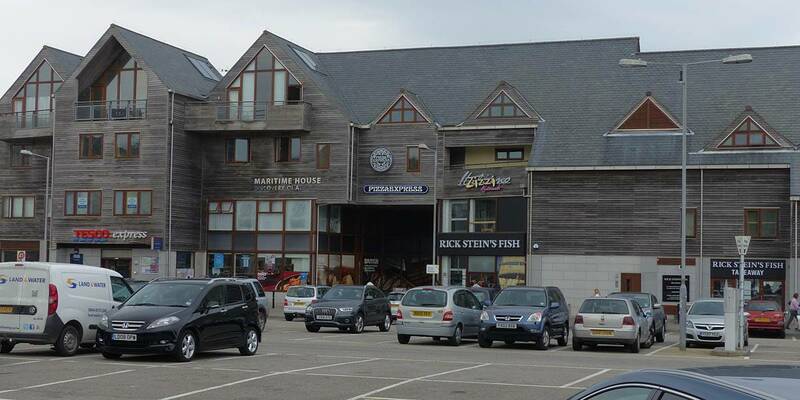 Rick Stein's and other reataurants just 5 minutes from the BnB. Peeking a view into the harbour. Views along the town centre as we walk along looking at theshops and restaurants. 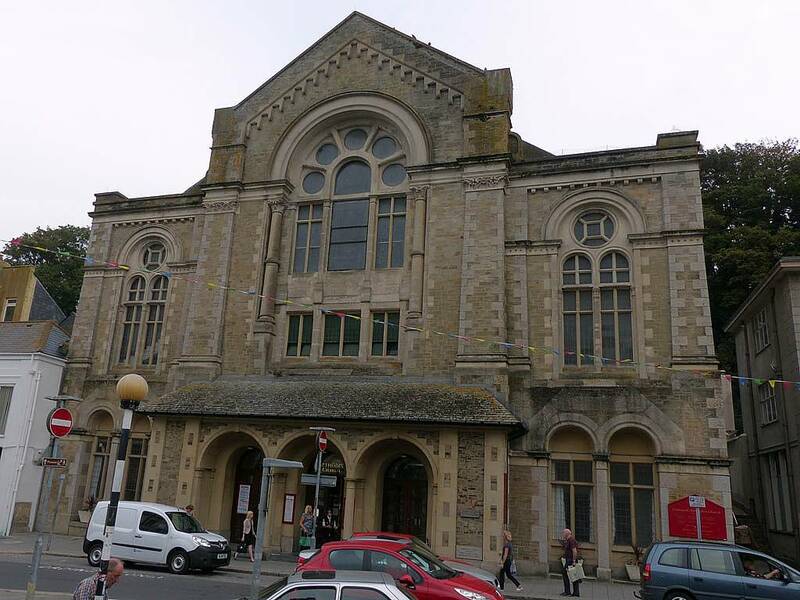 A church and a library in the town centre. A 360 degree panorama in Kiligrew Street. 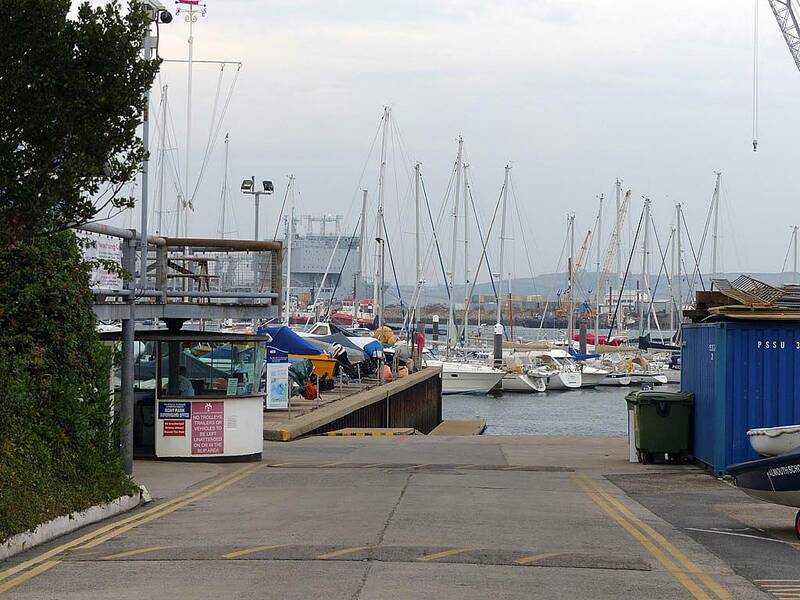 A pay and display car park with a view at Fish Strand Quay. 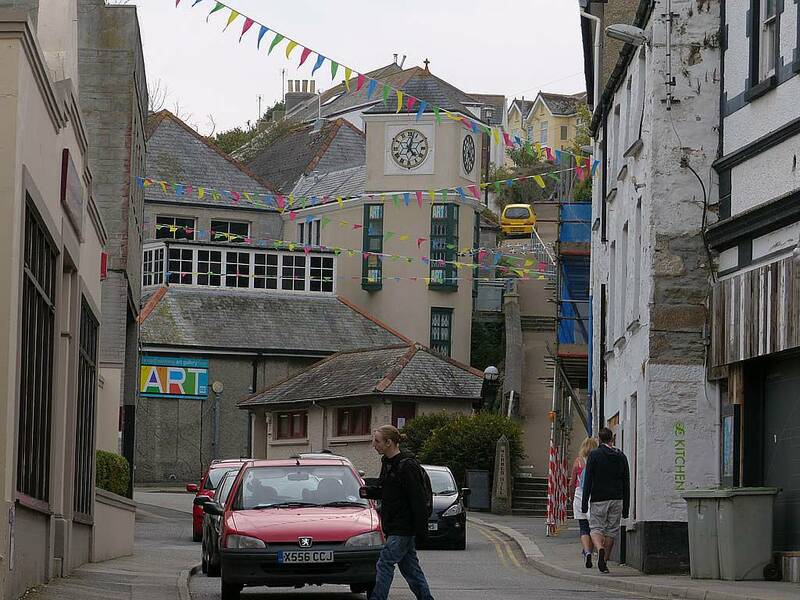 Walking back to Rick Stein's. Having a quick look around near the National Maritime Museum. 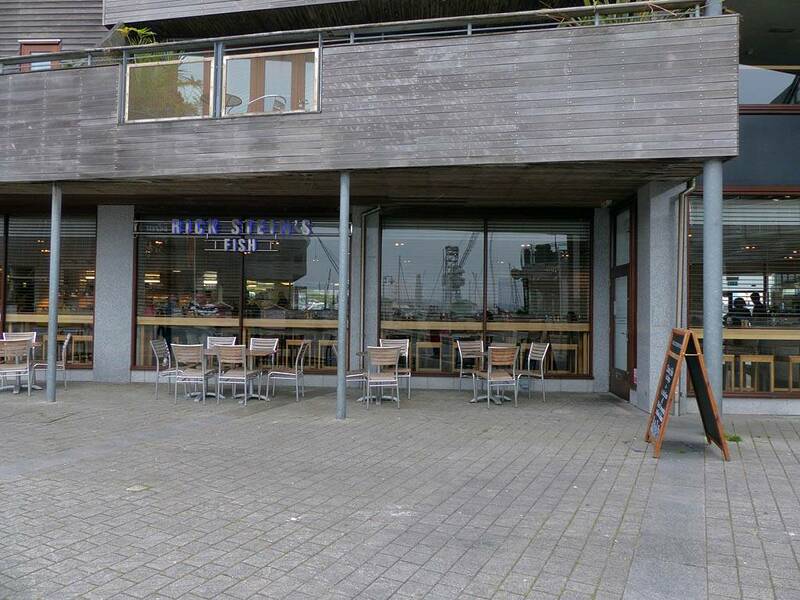 Rick Stein's from the back. 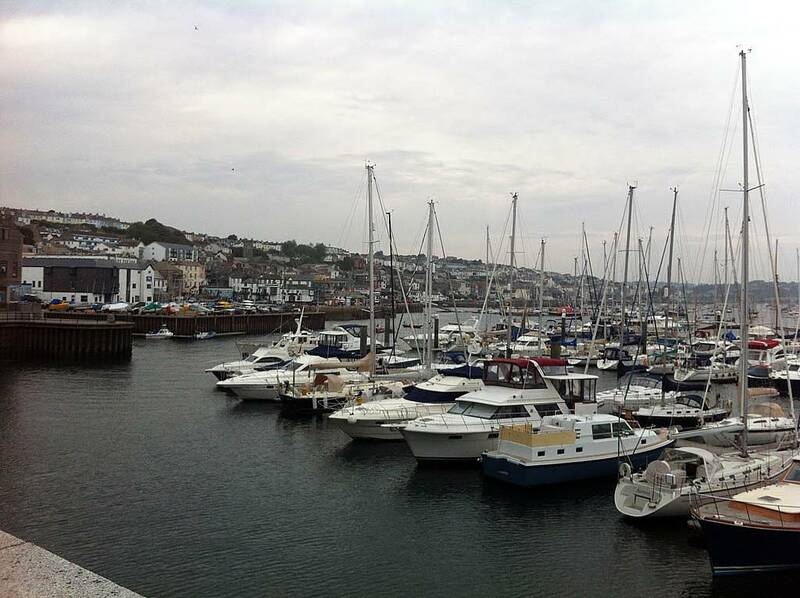 Views of the harbour from a walkway round the side of the museum. 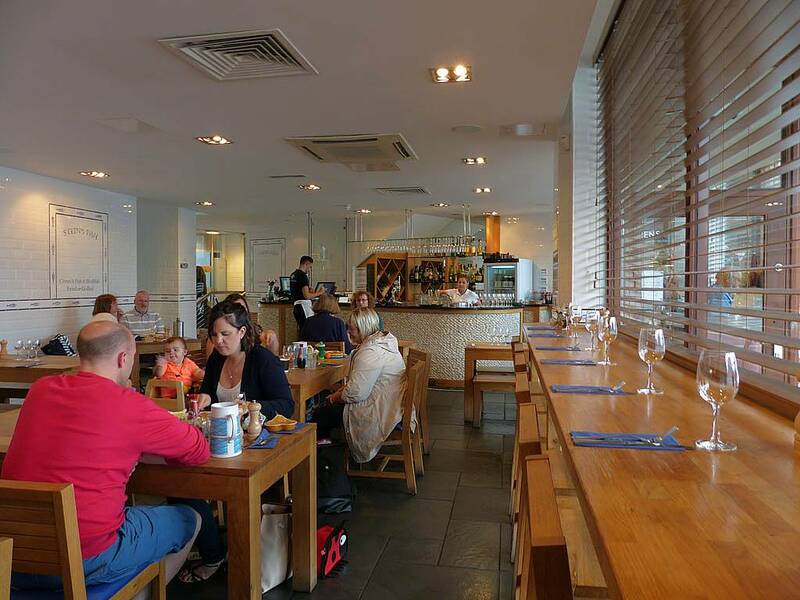 We went into Rick Stein's at 5:45PM as we were hungry. That was a good choice as they got my order wrong and I didn't get to eat until after 6:30PM. However they offered me a free dessert in compensation so literally a sweet ending. The food was very tasty. 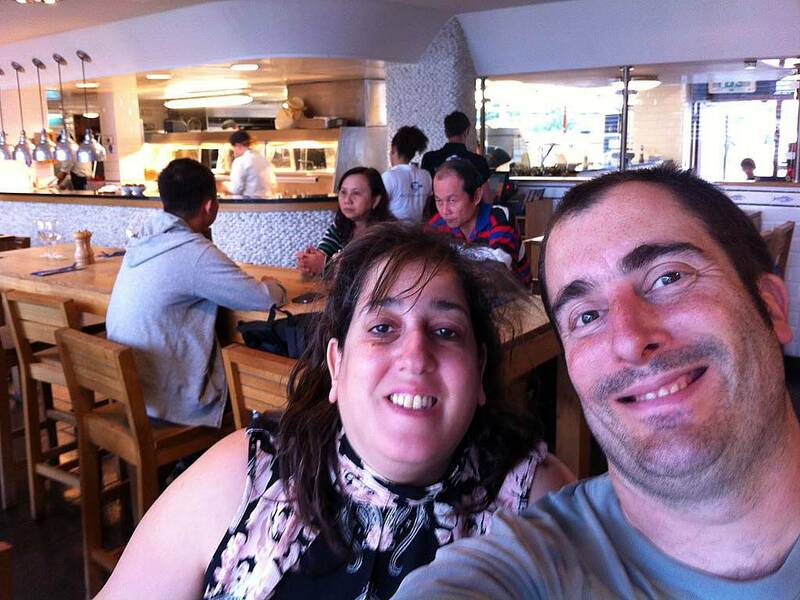 Renée and Mike at Rick Stein's restaurant. 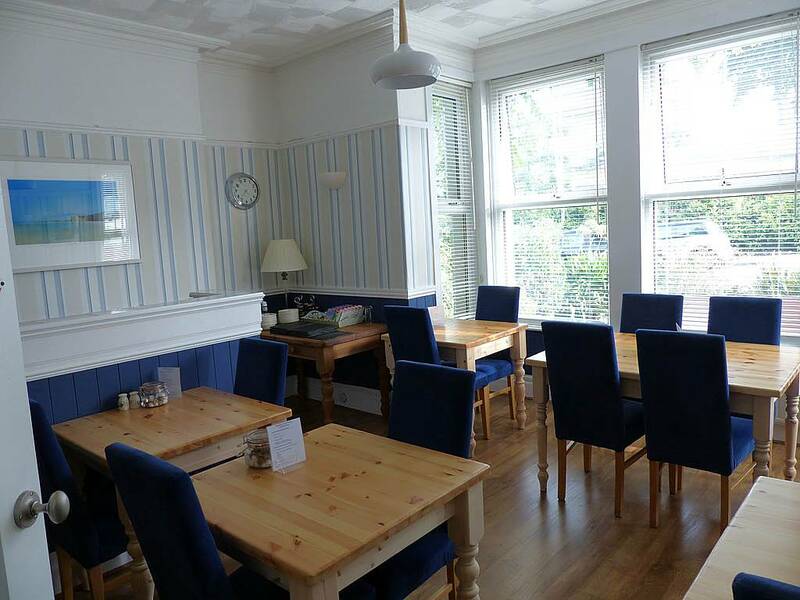 We were back in the BnB by 7:30PM and had an early and cosy night to recooperate after the early start.